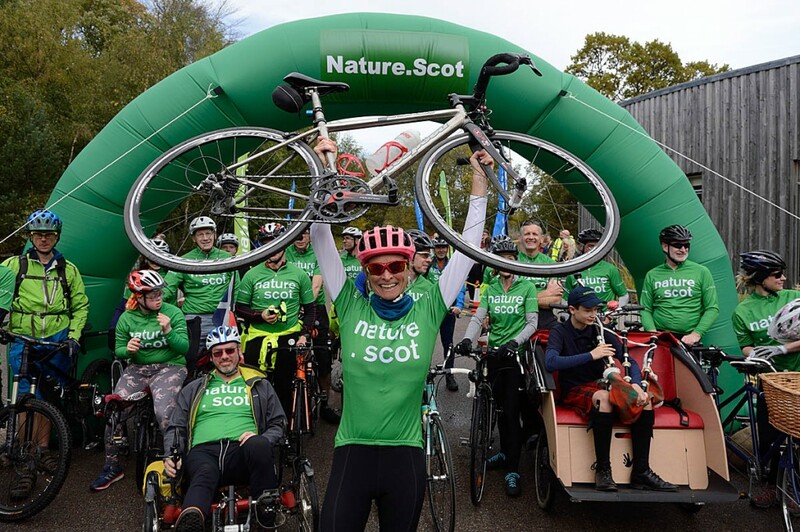 The boss of Scottish Natural Heritage has completed an epic 1,300-mile cycle ride round the nation in the hope of inspiring the public to get active. Francesca Osowska, chief executive of the Scottish Government’s advisory body on the outdoors, was in the saddle for 32 days, visiting 13 national nature reserves and the SNH’s 39 offices. She began the final leg of her trek on Monday, taking in Shetland, Orkney, Caithness and Sutherland before arriving at the organisation’s Inverness headquarters on Friday. Her journey began in March and was accomplished in seven separate legs each accomplished over five days. En route, she met as many of SNH’s 723 staff as she could, to experience hands-on the places and projects doing key work to protect the natural environment in Scotland and help people connect to nature. Partner organisations, including Scottish Action on Mental Health, joined the celebrations at the end of her venture, with music by Feis Rois, and Pony Axe S rides – designed to help people in wheelchairs enjoy nature – for Drummond School pupils. The event was rounded off with a talk by Marcus Stitz, the first person to cycle around the world on a single-speed bike in 2016 and founder of Bikepacking Scotland. Ms Osowska said: “This journey has been a real eye-opener for me during my first year with SNH. “I’ve seen so many of our stunning natural sights along the way, with a few adventures thrown in as well. From a pair of sea eagles in Stornoway to a seal encounter in Shetland to lacewigs at St Cyrus nature reserve, it’s been 1,300 miles to remember. “I’ve also met so many of SNH’s staff and got a real feel for the breadth of work that we carry out throughout Scotland. “It’s so important to connect with nature – getting out in the countryside is invaluable for both your mental and physical health. It’s essential to help me cope with stress and to keep myself healthy and happy. During her adventure Ms Osowska used the hashtag #cyclefornature while blogging and tweeting with the aim of encouraging people to be active in nature. She also raised funds for the Scottish Association for Mental Health through a JustGiving page, a charity voted on by SNH staff. The charity’s chief executive Billy Watson said: “Our sincere thanks to Francesca for choosing to raise money for SAMH during her cycle around Scotland.